Discussion in 'Competitive Discussion' started by Oka Chokka, Nov 28, 2018. The Kensa Splattershot Jr. is okay. Nothing too groundbreaking but pretty well-rounded in its abilities. The Torpedo complements the weapon's short range by being able to pinpoint opponents a fair distance ahead, but rarely splats opponents by itself. Frontal assaults are probably best done with a combination of Torpedoes and main weapon pressure. The Bubble Blower is a good defensive measure that offers opportunities for teammates to splat the enemy team, although the Kensa Splattershot Jr. takes time to pop the bubbles itself, given its low power and short range, which gives it less of an offensive edge when used without teammates nearby. Overall, I'd judge the Kensa Splattershot Jr. to be a decent support weapon designed to pressure the enemy. I wasn't able to elevate my Freshness to Raw with it, but I won some matches. Maybe it was just me getting used to the Torpedo. I'd recommend using abilities like Ink Saver (both Main and Sub) to get the most out of its inking and offensive potential. Run Speed Up would result in inking turf more efficiently, and I read that Special Power Up works well with the Bubble Blower. I'd recommend Object Shredder to burst the bubbles more quickly if the weapon had a bit more range, but it's always possible that the opponent could underestimate you and stick around long enough to get a surprise popping. I do not care much for the Custom Range Blaster. I think my main gripe with it is that its sub and special are somewhat redundant given the weapon's primary functions. The regular fire travels a good distance and explodes at the end, giving you a long line of ink to immediately swim down. It's faster and uses less ink than a Curling Bomb, which often gets used in the same manner. The Bubble Blower allows for some bigger explosions, and the Custom Range Blaster has no problem targeting the bubbles once they've been blown, but it takes at least two shots to pop one--even with Object Shredder attached--and given the weapon's poor fire rate, it still gives the enemy a wide enough opportunity to escape or retaliate. Obviously I did not elevate this weapon's Freshness rating to Raw in the time I used it. I think a better understanding of how to use its sub and special would benefit its play. The Curling Bombs are perhaps best used to ink turf in one direction while you head in a different direction, and if you can find an opportunity to take advantage of the fact that they ricochet off walls--something the Custom Range Blaster can't boast--all the better. The bubbles of the Bubble Blower are perhaps best used as a distraction for the enemy rather than for their splatting power, unless you have teammates nearby who can capitalize on them. As for abilities, I cannot recommend Ink Saver Main and Ink Recovery Up enough. This thing eats up ink like nobody's business. I can also see Thermal Ink being useful given the weapon's range and blast radius. This weapon is all about inking turf while providing support for teammates. The first thing you want to do, besides ink turf and build up your special, is to find good spots to lay down Squid Beakons and hope that your teammates will use them, if not yourself. Other than that, just ink everywhere and fire up the Tenta Missiles whenever they activate, leaving the majority of enemy engagement to them and your teammates. This weapon does not do well in frontal encounters with opponents given its ridiculously short range, unless you manage to get the drop on them. For that reason, I might recommend Ninja Squid as a compatible ability since ambushing opponents is about the only thing the Neo Sploosh-o-matic can do offensively. If you do run Ninja Squid, though, I'd also recommend piling on enough Swim Speed Ups to make up for the drop in speed, since this weapon's main strength is inking turf and inking it quickly. Special Charge Up allows you to spam Tenta Missiles even more frequently. I enjoyed using the Neo Sploosh-o-matic and I managed to elevate its Freshness ranking to Raw in the ten matches I spent using it. It's very good for Turf War although its effectiveness may depend a bit on how well you know the map and where good spots for Squid Beakons exist. Ah, the beloved N-ZAP. There must be a reason why these weapons have remained popular across the two games, and I think it's because its decent range, rapid fire rate, and low ink consumption make it so user-friendly and reliable. Its damage output leaves something to be desired, but again, its fire rate can make a steady aim deadly to opponents, who often underestimate how far it can shoot. (I know I have.) In addition, the Tenta Missiles charge up absurdly quickly, allowing you to lay down the pressure on the opposing team before you can even meet them at the beginning of a match. The Autobombs won't reliably splat anyone who's paying attention, but like the Tenta Missiles, they will force the opponent to move, potentially giving you the opportunity to catch them on the fly. Really, I don't see a whole lot of downsides to this weapon. As you might imagine, I managed to elevate this weapon's Freshness factor to Raw in the time I used it. I didn't win every Turf War--I do think the weapon is more inclined to inking turf than it is to engaging opponents--but I won more than I expected to. It all depends on how well you pressure the enemy. Don't be shy about throwing an Autobomb anywhere you see or might expect an opponent! As for abilities I can recommend, Ink Saver both Main and Sub are reliable in keeping your ink consumption manageable, and given how light the weapon is, Run Speed Up and Swim Speed Up can turn you into a speed demon. Also, although it's better at fighting opponents than the Neo Sploosh-o-matic, engagements won't always end favorably, so it may be nice to have some Quick Respawns on hand. Comeback can also take advantage of the N-ZAP '89's low life expectancy and boost all of the areas it already excels in. That's all of the weapons I've used so far in this challenge. Expect this thread to update off and on once I've used some more. Also, don't be afraid to make corrections if you think I've gotten the wrong idea on how a weapon works. Forma and Raumdeuter like this. You say the N-Zap 89 has low ink consumption yet you still recommend running Ink saver main?. Isn't that a bit contradictory? Even moreso, Ink Saver (Main) on the SS Jr. is kind of pointless. Its ink efficiency is tremendous. Ink Recovery Up or Ink Saver (Sub) are better for it if you're spamming subs all the time. Enperry and Oka Chokka like this. Thermal ink is completely useless on Blasters since it only activates after a direct shot, If a Range blaster directs the enemy is already dead. This is funny, but @Goolloom has a running joke that the neo is the best backliner....so as a joke I played it so....and it works almost too well. My logic was to make one of its good qualities even better. Looking back on that, maybe it's a bit unnecessary. Yikes. If that's true, then that's a huge detriment. Thanks for your feedback. I have to ask, though: what is sharking? Also, I realized I forgot a weapon. I like the regular Undercover Brella a lot, but something about this weapon just didn't click with me, and I failed to elevate it above a Dry Freshness rank. Its permanent shield (unless it gets destroyed) that retains the ability to shoot ink while defending is certainly a great boon in a fight, and while I normally triumphed one-on-one, the Undercover Sorella Brella is terribly vulnerable to being flanked, which happened to me very often. Perhaps part of the problem was that I was playing on stages like Sturgeon Shipyard that tend to funnel the teams through certain points, and while it was my instinct to separate from my team in order to cover more turf, I eventually realized that I needed to stick closer to my teammates in order to perform better, which is a bit ironic considering that the brella is only large enough to protect yourself and seems to be built for one-on-one battles. I don't see any problems with having the Splat Bomb and the Baller as its arsenal. I believe this was an instance where my underperformance was simply due to my own failure to adapt to the opponents' playstyles in a timely manner. Abilities that I think would benefit this weapon would be Ink Saver Sub to make the Splat Bombs more manageable, Bomb Defense Up to help defend against the bombs that opponents like to use to circumvent the shield, and Ink Resistance Up because trading blows with an opponent may result in a lot of enemy ink being dropped around you. Staying hidden in your ink, especially in a small puddle, close to wall or object, or near the enemy spawn, to ambush an unsuspecting foe as they pass by. Oka Chokka and Saber like this. And now for some new weapons. The Tri-Slosher Nouveau was a mixed bag for me. I didn't elevate it past the Dry Freshness ranking, and I can't really remember why. It has short range, sure, but if you manage to get within range of an opponent, two taps of the ZR button will splat them, and due to its wide splash, you don't have to aim well either. The challenge is getting within range of the opponent to pull it off. Like other slosher-type weapons, this weapon is useful for attacking opponents above and below you, though the limited range of the Tri-Slosher probably makes it better at attacking opponents below rather than above, so sticking to high ground is my recommendation. The Splat Bomb is useful for aiming at opponents beyond the slosher's range, and Ink Storm is always useful for covering some turf and encouraging nearby opponents to steer clear. In fact, more than once I found traveling within the Ink Storm's area to be a useful method of pushing through enemy ranks although there's certainly nothing keeping opponents from shooting at you from outside the circle. I wish I remembered more of my experience with this weapon so I could know where I went wrong with it. It's hard to come up with abilities that could complement it, but I can at least try: Swim Speed Up can help get you within an opponent's range to splat them, Sub Power Up can increase the range of Splat Bombs to give them even more oomph, Special Charge Up means more opportunities to activate Ink Storm, and Quick Respawn could help since most weapons outrange the Tri-Slosher and can splat one they see coming. These dualies are beefy little buddies; what they lack in fire rate and mobility they make up for in power and decent range. It's too bad that getting consistent hits on opponents who rarely stand still is nearly impossible, at least for me. Still, when they hit, they hit. The Splash Wall is pretty situational and only worked for me when I used them on narrow stages like Port Mackerel, but whenever the sub was used effectively, I usually ended up winning the game. Coincidence? The Baller is a good panic button (although I sometimes hit the button too late), but very often the opponents would be out of range of the explosion and shooting at me before I could get out of the way. I thought of a unique strategy involving the Baller in that I would charge the enemy but instead of exploding near them, I would loop around, find a good place to set up a Splash Wall, explode there, and then immediately throw down a Splash Wall, taking advantage of the enemy's tendency to disperse whenever they see a Baller approaching. It's a pretty defensive strategy and I didn't get many chances to use it, so I can't really gauge how useful it is. It seems like it may have a place in Ranked Battles more than Turf War. Speaking of Ranked Battles, I actually did take the Glooga Dualies Deco into a Splat Zones match, and I did well, helping to win the match. Granted, the stage was Wahoo World, where there were only four openings onto the Splat Zone that the Splash Wall could easily block, but still. I wasn't able to elevate these weapons past Dry Freshness, but I don't really dislike them. I think what really determines how useful they are is how well you use the Splash Wall. Abilities I can think of that would benefit them are Ink Saver Sub, Special Power Up, and Ink Recovery Up. I've used the Slosher a lot before this challenge, and using it again seemed to cement it as a solid choice for me. Its decent range make it easier for me to use than the Tri-Slosher Nouveau, and the Suction Bomb is useful for flushing out opponents who may be hiding in enemy ink ahead. Tenta Missiles never go out of style, though it's important to make sure you're in a safe place before firing them off. Covering turf is a cinch when aiming straight at the ground covers a large circle around yourself, and the Slosher also has a nice spot in Tower Control (which I did test out also) with its sub and special easily forcing opponents away from the tower. There's not much bad I have to say about this weapon. It seems to be pretty good all around. If I have one complaint about it, it's a bit boring to use, and I know that's an odd complaint, but it gets a bit tiresome having figured out all of a weapon's strengths and using them over and over and over again. I guess this is why I don't like sticking with one thing for too long. Nonetheless, I did elevate the Slosher's Freshness rank to Raw. Abilities I recommend for it include Special Charge Up, Run Speed Up, and Ink Saver Sub. I wasn't looking forward to this one. The first time I used the Explosher outside of this challenge, I hated it. I couldn't get a handle on how it worked and I lost every match with it. This time, however, I went in with a different mindset, and somehow or other I managed to elevate its Freshness rank to Raw, a fact I'm still baffled about. (To be fair, though, a couple of victories may have been due to one of the opponents disconnecting.) The thing to bear in mind about the Explosher is that it's basically the Dynamo Roller of sloshers, being slow and clunky in exchange for great range. To be successful with the Explosher means thinking of yourself as a pseudo-sniper, taking up a position accordingly, and launching ink from afar. If an opponent gets up in your face, flee or risk getting splatted, for this weapon fares terribly in close combat. The arc of the Explosher's shot also takes some getting used to (I had to learn to actually look at my crosshairs), but you'd be surprised by how far it reaches. If there's something I'm still trying to wrap my head around, it's the fact that this weapon is paired with the Sprinkler. It's not a bad choice, but I concentrated so much on getting used to the main weapon that I constantly forgot to even use the Sprinkler, and then, the Sprinkler takes a lot of ink to use, as does the regular weapon, so they're kind of at odds with one another. It should be an easy matter to lay a Sprinkler down at an area you don't expect to cover from your pseudo-sniping position, but practice makes perfect. Now, the Bubble Blower this weapon can do some neat things with. First of all, it's worth noting that with Object Shredder attached, a single Explosher shot will pop a bubble instantly, provided that opponents haven't subdued the bubble first. That's something I haven't seen from any other weapon so far, and the Explosher certainly has the range to reach the bubbles after they've been blown as well. Even if you don't want to use Object Shredder, another strategy I came up with is to throw the Sprinkler in the direction you intend to blow the bubbles, activate the special, and the Sprinkler will help fill up the bubbles as they pass it, making it much easier to pop them anyway. Now, I haven't exactly practiced these strategies, as I only tested them after I had my ten Turf War matches, but they seem cool enough. Still, I mostly found myself using the Bubble Blower simply to shield myself from enemy snipers. Other than Object Shredder, I would recommend Ink Saver Main, Ink Saver Sub, Special Power Up, and Run Speed Up particularly for the sake of dodging incoming attacks from your position. The Dapple Dualies Nouveau make me think of the Splattershot Jr. in how they fire; very rapidly, but also erratically and lacking in range. This makes them pretty good at inking turf but somewhat poor in combat. I know that dualies are most effective in taking down an opponent after a dodge roll, at which point both crosshairs intersect, but working with these weapons proved that I still have a lot to learn involving aiming while dodge-rolling. Toxic Mist is pretty good at keeping opponents who outrange you at bay, and Ink Storm is quite possibly the most spammable special in the whole game. Still, my lacking combat prowess and inability to avoid opponents resulted in me losing a great many matches and never elevating the Dapple Dualies Nouveau past Dry Freshness. According to Inkipedia, these weapons actually have a little higher attack power than the average dualies, so I guess getting better at the Dapple Dualies Nouveau basically means getting better at aiming after dodging. Still, I think I can accept the idea that these are weapons that simply won't click with me. If I could improve their performance with abilities, I would probably choose Swim Speed Up, Ninja Squid, Special Charge Up, and/or Bomb Defense Up. I really like the Foil Squeezer. Although I dipped back down into Dry Freshness after the second-to-last battle I used it in, I still managed to end my run with it in the Raw category. The initial ZR button press spurts out a shot of ink that travels farther than the rest of the ink that spurts out upon holding ZR. As Sheldon advises, repeatedly tapping ZR is ideal for shooting at opponents, while holding down ZR is good for inking turf. The Splat Bomb doesn't normally travel much farther than a tap-shot, but it's a good option for tossing onto ledges or for trying to flush out opponents you can't see. The Bubble Blower I found using in a much more offensive manner with this weapon than I usually do, and more than once I managed to pop a bubble with tap-shots and splat an opponent. Noco and Raumdeuter like this. The Explosher is one of my mains as well, one of only three weapons with which I have SUPERFRESH. I don't think the comparison to the Dynamo Roller is helpful. It has massive range and inking, but the damage is low unless you get the pierce-burst like Saber said--and even then it's only 90 damage and the TTK is still bad. It's an excellent zoning weapon, though, and I'm eager to see what Main Power Up does with it (supposedly increases its inking, which is already superb). Thanks for the advice. Now for some more weapons! The Kensa Splat Dualies landed it in my head that dualies in general probably just aren't for me. I find nothing wrong with the sub and special--I think the Suction Bomb gives the weapon a useful punch where the base weapon wouldn't fly, and the Baller pairs well with the dualies' offensive nature. Rather, there may be something about the dualies' nature that I simply can't grasp. I've seen people splat me with these weapons at seemingly the perimeter of their range plenty of times, but whenever I try it, I get outgunned. I try dodge-rolling a lot as well, but this brings to light that there may be some latency issue on my end, as even when I dodge out of the way of somebody shooting directly at me, I end up getting splatted by the end of my dodge-roll even when the opponents' ink wasn't--and shouldn't be--touching me. And if that's the case, then I can't imagine dodge-rolling will suit me well in the long run. I didn't elevate these weapons past Dry Freshness. I don't feel confident recommending abilities for them, but I'll try anyway: Ink Saver Sub always seems useful for Suction Bombs, and Special Power Up would enhance the Baller's defensive capabilities in the thick of battle. Ink Recovery Up also seems like a good option since dodge-rolling consumes some ink and an extended fight might leave you strapped afterward. Trying this weapon out immediately after the Splattershot Pro showed me that the two weapons have a lot of similarities: they're both rather slow shooters designed for range and power. Compared to the Pro, the .96 Gal Deco has barely more range and does more damage at the expense of having a slower fire rate. Knowing that, I tried to use it like a pseudo-sniping weapon, but it didn't quite work out. I think that in the long run, its slower fire rate killed it for me, as many players managed to close in on me and splat me before I could land more than one hit. That said, I had a lot of fun utilizing the Splashdown, especially in Super Jumping toward allies in the enemy's side of the map and activating it in midair (a trick I picked up from watching some high-level players). What was more, I could often render my opponents wide open to attack afterward--assuming I didn't splat them--by throwing a Splash Wall their way, as I had no need to worry about ink efficiency following the usage of my special. The Clash Blaster Neo has a very short range but has a high fire rate for a tradeoff. Each individual shot is lacking in power, but given its rate of fire and blast radius (it takes no more than four indirect hits to splat someone), it's fairly adept at knocking out opponents. The challenge, of course, is getting close enough to someone and remaining close enough to splat them. The Curling Bombs do a great job at covering the distance the base weapon lacks, and for actual fighting, I find strafing to be an efficient strategy in minimizing damage to yourself while managing to still pelt the opponent with shots. Tenta Missiles give you an even longer range for offense, and as is the case with most Tenta Missiles, it charges up fairly quickly to boot. Regardless, I couldn't elevate the Clash Blaster Neo past Dry Freshness. The weapon may be good for combat, but a turf-inker it isn't. I did take it into a few Rainmaker matches, and I think it really shines in that mode. Hitting the Rainmaker's shield with direct hits does a great job of filling it to bursting, and Curling Bombs are great for forging a path forward for the Rainmaker carrier. Not to mention that since everyone tends to congregate near the Rainmaker, it's rather easy to target all four opponents with Tenta Missiles. I was actually able to help win a Rainmaker match when I started with only two teammates against the opposing team of four. I don't know if the opponents held back or not, but while we didn't KO them, we still covered the most distance, and I had splatted the opponents a whopping 24 times by the end of it. I think it's safe to say this weapon fares better in Ranked Battles than in Turf Wars. Abilities I would recommend for it include Run Speed Up, Ink Saver Sub, and Ink Resistance Up. The Custom Hydra Splatling seems to be the ultimate anchor, serving its purpose best when it stays rooted to a specific, usually higher-ground area and sprays ink everywhere, activating its Ink Armor special whenever viable to lend allies support. The odd one out in this set is the Ink Mine, which encourages you to go out of your way to place it in spots that opponents are likely to come through, thus ruining the Hydra Splatling's up-on-high playstyle. The benefit of marking opponents is a good one, but it comes at the expense of putting yourself in harm's way, and while it only takes about a quarter of the way through the first charging reticule to splat somebody provided you land your shots, the Custom Hydra Splatling is so slow and heavy that any time not spent swimming essentially leaves you as a sitting duck for anyone within range to splat you. awedry and Noco like this. Okay, so as a Custom Range Blaster player, I just had to comment on this. I don't think you gave the weapon a fair chance seeing as you played it in turf war. Which isn't a bad thing, but I wouldn't judge the weapons capabilities in a turf war setting. Since the Range Blaster (this trait is even more pronounced with the Custom variant), cannot ink fast at all. It's slow rate of fire and bad painting pattern make it one of the worst weapons to paint the map with and one of the slowest weapons to get their special. As the curling bombs don't paint large areas, and the bubbles don't come too quick without a weapon to help you paint fast. So in my eyes, it's an invalid test to see the true potential of this weapon. Spoiler: What is it good at? So, what is it good at? For the context of splatoon, splatting. The range blaster main weapon is phenomenal at fighting most weapons in the game, demolishing common weapons like the Custom Blaster, Tentatek splattershot, Vanilla Splat Roller, Emperry/Kensa Dualies, and N-Zap 85 with it's superior range. As well as being one of the best counters to inkjets. The longer range weapons all fear it's AoE damage, as the range blaster can shark them and kill them underneath their precious high ground. The Splat chargers, Heavy / Hydra Splatlings, Rapid Blasters, and Explosher are vulnerable due to their low mobility, giving a range blaster no problem landing their two indirects. Not to mention it instantly wins a 1v1 up close if the user lands a direct shot, making it able to tear through a team extremely quick. Spoiler: What is the kit useful for? But why would the curling bomb and bubble blower help this weapon achieve this goal? Curling Bombs help you get out of danger quickly, as launching one across the stage leads to a faster and longer distance getaway than your standard blast. Not to mention the curling bomb's ink trail and explosion of ink help you gain your special faster. Also cooking one up close can be a decent way to space out up close opponents. The Bubble Blower helps the weapon close in distance if anything. The bubbles are a useful shield that help you assert your presence on the field. If you can pop them, they grant the weapon a ton of room to swim and possibly some chip damage that you can finish with an indirect blast. However that's if you can pop them. The sluggish DPS from the range blaster makes it difficult to pop your own bubbles if there are opponents shooting at your bubbles. Though to help mitigate this without the help from others, curling bombs can be a lifesaver. As they give the weapon some safety to pop the bubbles, and a way to rack up damage without waiting a while for another blast to come out. A good technique that will let you pop a bubble really fast is cook a bomb under your feet, let it go, use your special to have a bubble eat the curling you put on the floor, and immediately throw another curling bomb after that. It's a really fast combo, but it should pop that first bubble rather quickly. I could definitely get this on a video if you want to see it in action. Bubbles are also really useful for stalling an objective, or progressing the objective like moving a power clam through enemy territory, or shielding your tower ride. Combine that with the main weapon's ability to stop tower pushes, and get picks on the enemy team, you've got a fearsome weapon to help take the objective with aggressive force. For abilities, Comeback is a must. Swim speed, and at least 2-5 subs of ink saver main are preferred. Swim speed to help you position quickly (easier indirect spacing), and ink saver main is useful for giving you some extra shots to work with, since the original 9 from a full tank really doesn't do it for me. The rest is up to what you want more. Special power up for good bubbles? Or Main Power Up for more accurate jump shots? Quick Respawn + Stealth Jump is falling out of favor, but it still works with the weapon. And I know someone mentioned this, but thermal ink doesn't work with the weapon since indirects don't trigger thermal ink, only direct hits will, and the range blaster will kill the opponent before you're able to track them. First and foremost, I have a main of swim speed on this build. This helps me land consistent two shot indirects against targets running away from me, and gives me some speed for 1v1 fights. I have 5 subs of ink saver main to give me 11 shots from a full tank, instead of the default 9 shots. Then I have the "Glue" of the build, Comeback. Comeback is extremely important when it activates as it gives you a main's worth of the following abilities: ink recovery, ink savers sub and main, swim and run speed, and special charge up for 20 seconds after respawning. Which gives me 12 shots from a full tank upon respawning, a pure of swim speed to work with, and ink recovery, ink saver sub, and special charge up work together to help me gain more special charge from curling bombs. Allowing me to gain my special back, and start turning the match into my favor. I invested in special power up to give me bubbles to work with, as bubbles of this size can take objectives and shield from opponents much more consistently than bubbles without special power up. The last two subs I gave to special saver, as it's an impactful boost from just 2 subs, and it's something the Custom Range really struggles with, having one of the slowest specials in the game. I hope this helped widen your eyes a bit to the potential of the weapon. I know you were just putting it out there for a test run, but I feel like you overlooked some things. If you read all of the words above, I hope you find a nice internet cookie and have a nice day. Noco, Oka Chokka, calamaro and 2 others like this. Thanks for all of your input, ThatOneGuy. I really appreciate it. I will note, however, that since Ranked Battles don't keep track of weapons' Freshness rating the way Turf War does, and since that's the easiest way for me to determine how good I am with a weapon, I will stick to Turf Wars by default. I could just keep track of my wins and losses in my head for Ranked Battles, but then I'd also run into the roadblock of having to resume the game every 2 hours or so for about 8 hours in order to participate in every kind of Ranked Battle to see how well each weapon fares, and that's a bit too much work for my schedule. So, my apologies, but Turf War is going to be my forte unless I state otherwise. I have a soft spot for the L-3 Nozzlenoses--the L-3 D version in particular, but I managed to get the regular L-3's Freshness ranking to Raw regardless. Its unique method of firing can be a bit off-putting at first, but once you get down the rhythm of tapping the ZR button, it's a pretty efficient inking tool. It doesn't do a bad job of splatting other players either given its nice range--longer than a Splattershot--provided you're able to keep your aim steady. Curling Bombs are okay; I mostly used them as a means of travel or inking un-inked turf while I swam somewhere else. Lastly, the Baller I would usually use to storm the enemy's turf and do some damage with the inksplosion, following up with a Curling Bomb or rapid fire aimed at a nearby opponent who survived. It seems to me that this strategy rather exemplifies the L-3 Nozzlenose's usage: to storm the enemy while also inking decent patches of turf, and I probably owe my Freshness ranking to this versatility. Since storming the enemy is bound to result in getting splatted sometimes, two abilities I would recommend for the L-3 Nozzlenose are Quick Respawn and Comeback. Curling Bombs use up a surprising amount of ink, so Ink Saver Sub isn't a bad idea, and Run Speed Up can be useful seeing as this is a shooter that involves more non-shooting time than most others. Lastly, Special Power Up can increase the effectiveness of the Baller. The day after the L-3 Nozzlenose was recommended as the lucky weapon, Callie recommended the N-Zap '89. You might notice I've already covered that weapon up in my first post. I guess this means that Callie doesn't cycle through these weapons in a certain order; she simply selects one at random. That makes my task a lot harder. Still, I didn't let this day go to waste and I decided to work enough Grizzco jobs to buy me the Custom Hydra Splatling, which I couldn't afford when Callie first recommended it. You can see what I thought of it two posts up. This was a bit of a wild ride for me. I actually had the Blaster within Raw Freshness before I began this project, but after using it again, I dipped down to Dry before rising back to Raw again. This weapon's short range but high power mean it's essential to get close to your opponents in order to make use of it, and in that sense, it pairs with the Splashdown special well. Toxic Mist is useful for slowing down opponents so that you can take better aim at them, and if they leave the mist, you can chase them down by entering the mist yourself since I believe--correct me if I'm wrong--that your own ink supply refills faster within Toxic Mist of your own color. It may be negligible, but given this weapon's high rate of ink consumption, it could definitely have its use if it is so. Even though the Blaster seems to be at its best when used against opponents, its better fire rate than the Custom Range Blaster makes it decent at inking turf as well, which is probably what saved me. Much like the Custom Range Blaster, the Blaster uses up ink relatively fast, so Ink Saver Main is an ability I'd say it can't go without. Ink Recovery Up is another ability that can help mitigate this tendency. I also recommend Comeback and Quick Respawn due to its close-combat nature probably leading to many deaths. The day after the Blaster, Callie recommended the Clash Blaster Neo to me, which I've also done already. Ah, the perks of random selection. At this rate, I'm not sure if I'll be motivated to keep up this project. I'm a big fan of the Custom Hydra and agree that it's a fantastic anchor weapon. Mobility and situational awareness are essential to succeeding with this weapon. You will be rushed by slayers and targeted by specials constantly, and you'll frequently check the HUD and map to know who's down and to help in positioning. The more I play the Hydra, the more I value Run Speed, Swim Speed, and Quick Super Jump abilities for survival - the recent buffs to some of these reinforce this even further. Also, as an anchor one of your goals is to die as little as possible, so I would suggest Tenacity to help build Armors for your team. I also run Ink Recovery on the Hydra, I find it serves a dual purpose by helping with the main and sub weapons. Main Saver is helpful too, but you have to stack it quite a bit. I'm trying the new Main Power Up ability as well but I'm not fully sold yet, but it does appear to help make the weapon more consistent at maximum range (thanks to falloff damage). Re: Ink Mines, I really like this sub on the Hydra. While you may have to advance further than you might want to when placing them, they act as a deterrent to people who might flank you. If someone triggers a Mine, you'll know about it. It gives you a bit more time to react to the flanker, making it easier to survive and potentially defeat them with a partial charge since they've been tagged with some damage. They also have some unique applications like re-inking a part of the Zone, and it's always satisfying when a Mine deals the finishing blow to someone who's just splatted you. I've been busy + sick, so I have a lot of weapons to catch up on. Here are the first three. In my experience, the H-3 Nozzlenose D seems to function best as a mixture of an anchor and a slayer--take up a position, preferably near the middle of the map, and with the weapon's range and splatting potential, focus on picking off any opponents who come your way, making sure to keep a safe distance between yourself and them since the H-3 outranges most other shooters. This strategy seems reliant on actually having control of your chosen stakeout, since if it's covered by enemy ink, you really need to pull back and try to help your team take it over. The weapon's fire rate is slower than the L-3 and takes more getting used to, and since it still shoots out only three spurts per shot, I can't recommend it for inking turf. At first, I thought the Suction Bomb was a redundant sub weapon since the main weapon is already very capable of splatting an opponent with a well-aimed shot, but then I realized that since players tend to avoid Suction Bombs like the plague, they can be used to cut off an opponent's avenue of escape so you can instead aim down an alternative route to catch them off guard. No complaints with the Ink Armor ability. Despite coming up with this useful strategy, I wasn't able to elevate this weapon's Freshness past Dry. I can see it being more useful as a defender for Splat Zones. Abilities I would recommend for it include Tenacity, following the advice of awedry above for anchor-like weapons bearing Ink Armor and also since the H-3 isn't the best turf-inker; Ink Saver Sub and Sub Power Up to give the Suction Bombs a bit more versatility; and Run Speed Up to improve your evasiveness while shooting. I tried to be good with the Ballpoint Splatling Nouveau. I really tried. From reconning stages beforehand to find good spots to lay down Squid Beakons as well as good vantage points to be an anchor from, to learning how the target reticule changes from the weapon's initial short-range spurt to its long-range spurt, I tried my darndest to play this weapon to its strengths, but I still lost nearly every match I played with it. One of the main aspects to remember about this weapon is, when you're aiming to splat an opponent, you should start off aiming slightly below them since the target reticule raises when the Splatling shifts into its long-range mode. Since most of this weapon's utility seems to come from its long range, this leaves its short-ranged mode as a bit of an oddity, especially given how it only lasts for about a second before shifting. One would think that the short-ranged mode would be best suited for close combat, but in practice, even the short time it took me to wind up the Splatling was still precious moments that the opponent would take up constantly shooting at me, rendering it ineffective. The only other aspect of the short-range mode I can deem of any use is inking nearby turf, which the weapon is still not particularly adept at. One other problem I had with the Ballpoint Splatling Nouveau was finding opportunities to leave my perch and set up Squid Beakons for my teammates to use. Maybe it was because I was terrible at splatting enemies enough to encroach on their territory adequately, but I would always end up splatted in the process of trying to make such a push, owing no small amount to this weapon's awful close-quarters functionality. I did come up with a strategy that involved setting up a Squid Beakon on my anchor spot before attempting to dive down to a more appropriate Beakon spot and then super-jumping back to my anchor spot after laying the second Beakon, but again, not many safe opportunities arose for me to do this. If I had to recommend abilities for this weapon, they would probably be Quick Super Jump and Sub Power Up to increase the speed with which to jump to the Beakons. I'm not sure what other abilities I would recommend. This is probably another weapon that fares better in Ranked Battles than Turf Wars, as I did take it for a spin in Rainmaker and did fairly well with it. My strategy for the Range Blaster in Turf War was this: Forget about inking turf. Leave that to your allies. Just go for the enemy and splat them. Splat them good. Once I adopted this strategy, I noticed a substantial improvement in my team's performance, although it brought me to another obstacle I have yet to surmount: I'm not very good at splatting people. One would think it would be easy with the weapon's range and blast radius, but the poor fire rate coupled with the fact that I was going up against ridiculously high-leveled players who knew how to weave around my shots like they were nothing, posed quite a challenge to me. I don't really have any complaints with the Suction Bomb or Ink Storm--more often than not, they opened opportunities for me to advance. I still managed to splat more than a few players, but...those high-level players, man. Now, one of my Splatoon acquaintances told me that the Range Blaster is overpowered in Tower Control, and having tested it out in that mode, I can see where he's coming from. Being able to consistently damage players on a relatively slow-moving target from a decent range as well as force the players away from the target with both the sub weapon and special is nothing to sneeze at. I guess this goes to show that some weapons simply aren't designed with Turf Wars in mind. As far as abilities go, I should note that I practiced this weapon with plenty of Ink Saver Mains equipped and it really made a difference compared to my previous stint with the Custom Range Blaster, so I definitely recommend that ability. I might also recommend Special Charge Up to increase the spammability of Ink Storm and Respawn Punisher since this weapon specializes in splatting opponents from a good range. I was very pleasantly surprised with this weapon. Given that it has less range than the standard Blaster in exchange for a slightly better fire rate, I wasn't expecting to do very well with this, but it worked for me. My takeaway from the Kensa Luna Blaster is that the Fizzy Bomb is hands-down the best kind of bomb a Luna Blaster could have, as not only does it have the range the blaster lacks, it also leaves a trail of ink from your spot to the spot where it lands, giving you a quick path to swim down. Yes, the Curling Bomb does the same thing, but while a Curling Bomb is predictable and explodes once, the Fizzy Bomb will explode up to three times down the direction it was thrown, but with some random variance. This is just distracting enough to opponents for you to swim down to whoever sidestepped away from the Fizzy Bomb--as that is the best strategy against a Fizzy Bomb--and pop out and nail them. It's a bold strategy, but whenever I tried it, it worked. I was impressed. The Ink Storm is as good as ever, though I mostly used to ink areas out of my reach as I focused elsewhere, rather than using it as a pressuring tool. I managed to get Raw with this weapon, and I'd definitely enjoy going back to it. 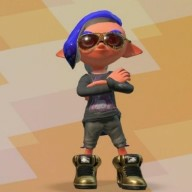 Abilities I would recommend for it include: Swim Speed Up to get up in your opponents' faces faster, Ink Recovery Up to take advantage of the generous amount of time you'll spend swimming with this weapon, possibly Ninja Squid to hide your ink splashes as you swim to make it more difficult for opponents to track you, Ink Resistance Up to reduce drag as push through enemy lines, and Special Charge Up to increase Ink Storm's spammability. I also managed to get Raw with this weapon. It seems like any weapon with the Sprinkler is probably going to do well in Turf War, or Splat Zones. Abilities I'd recommend for the .96 Gal include Ink Saver Main, Swim Speed Up, Run Speed Up, and Special Charge Up. All of the concerns I had going in with the Kensa Luna Blaster earlier were founded when I used the normal Luna Blaster. Its sub weapon and special aren't bad, all things considered, but the Splat Bomb doesn't give you the leeway of an inked path the way the Fizzy Bomb does, and the Baller is good for when you're in close quarters with multiple opponents--which can happen a lot--but it's just not as versatile as the Ink Storm. It doesn't help that when I threw a Splat Bomb, it was usually with the intention of splatting someone as opposed to opening up another avenue of splatting someone more easily. The Splat Bomb takes a lot of finesse to use effectively, and the only thing it really has over the Luna Blaster's base shots is its range. You might as well capitalize on that by equipping Sub Power Up to increase the distance you can throw it. Special Power Up is good for the Baller, and Swim Speed Up, Ink Recovery Up, and Ink Resistance Up can carry over from my recommendations for the Kensa Luna Blaster. I didn't make it past Dry with this weapon. I did try it out in Tower Control with about the same amount of success that I had in Turf War, meaning, not much. Maybe it would do well in Rainmaker, I don't know. Oh, Rapid Blaster, what happened to you? Before I took this challenge upon myself, you were one of my favorite weapons, being one of the first that I got a Raw Freshness ranking with. Now that I've used you for this challenge, your Freshness has plummeted back to Dry. Were you nerfed at some point in the Splatoon 2 updates? Checking Inkipedia, it seems...no, you've received nothing but buffs. So what happened? Has it been so long that I've forgotten how far your shots travel so that I can properly zone the opponents? Did I grow complacent, thinking that since I was good with you before, that I'd continue to be so now? I was surprised to find that a direct hit with one of your shots wouldn't instantly splat an opponent and that I'd have to consistently follow up with more shots... And come to think of it, I never did put in a proper effort to place Ink Mines in good spots. The Splat-Bomb Launcher I mostly used to rain mayhem upon the opponents' turf, which is how I believe it should be used; any time I tried to splat someone with it, I would get off only about two bombs before they would close the distance and splat me. Maybe our lack of success was due to the fact that the Rapid Blaster coats the turf with very thin lines of ink and I only tried to go over them upon respawning, as my first priority was trying to meet the enemy and splat them. Woe is us, Rapid Blaster. If I could, I would go back in time and outfit you with Run Speed Ups, Sub Power Ups, Ink Recovery Ups, and Comeback in order to right our wrongs. But such an endeavor must be saved for the future. ...I...I got a Raw Freshness ranking with this. …How. So, the gist of this weapon, from what I've made of it, is to take up a sniping position (and don't feel like you need to limit yourself to just one), and shoot at any opponent you see, or just shoot over any uninked/enemy turf if you can't see any opponents. If someone gets close enough to start hitting you with their shots, back off just enough to give yourself the space to throw a Splash Wall onto your spot's perimeter, and then go right back to trying to shoot the opponent. The Splash Wall also saved me when I got into a close confrontation outside of my sniping spot, as I constantly ducked through it and back whenever the opponent tried to outflank me, and even though I was just tapping the fire button to try to pelt them with enough lucky shots to splat them, it worked. The Suction-Bomb Launcher could be useful in flushing out opponents hiding behind walls, but more often it simply splats them or else persuades the enemy to stay far away. I was surprised by how far I could throw the bombs by holding down R, though. My aim was rather shaky, and still is. I had my controller's sensitivity up pretty high before, but I think this is a weapon that prefers a lower sensitivity, as when you're zoomed in, even the tiniest movement can mean the difference between hitting your target and missing it (when you have high sensitivity). I made miniscule adjustments after finding out how annoying that was, but I guess I still performed well enough if I got a Raw Freshness ranking? As for abilities, I might recommend Opening Gambit to get into your sniping spot as soon as possible, Run Speed Up / Swim Speed Up to help you dodge incoming fire, Ink Saver Main / Ink Saver Sub / Ink Recovery Up to help conserve your ink supply between your charged shots and Splash Walls, and Respawn Punisher to capitalize on your role of splatting opponents while staying alive yourself. The beauty of the N'Zap is that it is an extremely agile weapon. Low ink consumption and good ink coverage means that you can traverse the map really quick like a walking (or, swimming...) curling bomb and cover lots of turf in the process. With this weapon, you really want to pick your fights: avoid engaging people head on (especially when they are aware of you going after them) and only attack when you are in a favorable position. Neither of the N'Zaps are especially strong in 1v1s, but they do have decent kill time against unsuspecting/ cornered players. Ideally you should be fighting in your own ink all the time, and punish players who wander too far into your territory or get pushed into a corner. Personally I think N'Zap 85 has a better kit. The suction bomb serves well to block off flanking routes & add a bit more ink coverage, and Ink Armor gives you a 'Press RS to win' option to challenge any other player in a 1v1 situation. Plus, Ink Armor is incredibly strong in ranked games if you can get your team to play around it. Also, during my time in ranked battles, I am surprised how many times N'Zap players manage to sneak up on me. N'Zaps and Rollers are the top 2 weapons that annoys me as opponents in ranked play. Rollers are pretty straight forward: they just lurk around the corner and 1-shot you when you pass by. But N'Zaps are a real pain in the right hands: they cover lots of turf if you let them go unchecked, and are very hard to catch. And when you finally think you can challenge them to a duel, BLAM, Ink Armor. Well, I've done a terrible job of keeping this thread up even though I've been following through with the lucky-weapon-of-the-day practice. This may be a cheap and/or lazy move, but I think I'm going to ditch my reviews of the weapons and just list what I've practiced with and what my resulting Freshness was. Raumdeuter and Noco like this.